A series of 115 short essays written by eleven courageous canines who are willing to tell the truth about dogs every last dirty, hairy, bit of it: why they always dash to a rug when they have to throw up, why they eat furniture when endless chew toys are nearby, and why they're always absolutely starving. 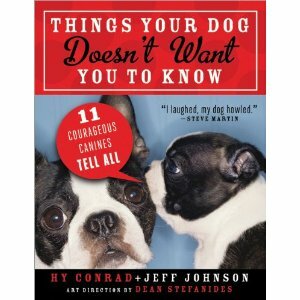 Peppered with lively, clever stories and visually appealing photographs, Things Your Dog Doesn't Want You to Know is a must-have for any dog lover. It's a verbal and visual delight that is laugh-out-loud funny. "If everyone owned a dog, we would have world peace. If everyone reads this book, they will go and get a dog and we will have taken a big step in the right direction. So this book can save the world." Hy Conrad has spent his career writing for television -- he's one of the original writers for Monk, the USA series, and he was nominated three times for the Edgar Award for best TV Mystery episode. he has written a mystery series published by Sterling.Currently he is a writer and consulting producer on the TV show "White Collar." Jeff Johnson spent most of his life working in advertising, for giants such as JWT and DWB&B and prestigious creative shops, and he has created successful campaigns in nearly every consumer category. He wrote THE HOURGLASS SOLUTION: A BOOMER'S GUIDE TO THE REST OF YOUR LIFE. Yes, I used exclamations points!!! This quick, little read about eleven dogs, from hippy-dippy to obedience school drop out will have you howling. Of course, there is a dachshund involve and Gabby captured my heart. She is a bit (ok, extremely) spoiled and a bit ditsy but she makes no excuses for it. Tinkerbell, a Chihuahua, is tired of being stuffed in a purse and has lots of friends she likes to hang out with. Don't piss her off since she might grab that blouse in a dressing room and accidentally use it as a nest in your giant purse which might lead to your arrest. Moonbeam has been adopted by a vegan, and must sneak out for any kind of meat which might just be making him a bit crazy, not to mention the name. Overall, this fun read is perfect to leave on your coffee table and it is easy to pick up, read a few pages and then come back to it, sort of like your dogs attention span when food isn't involved.